Devi-devtas of coming from various places of Kullu pay respect to Raghunathji at Dhalpur as they reach and settle down at their respective places allotted to them. Raghunathji. They are offered, on behalf of the temple, a phagu (a long yellow coloured piece of cloth). Then they come at the praul (the main gate of Tharah Karudu in the palace). The main deities stay there for the day’s procession. The remaining deities proceed to Dhalpur for participation in the reception of the procession. By afternoon, the rites to be performed before appearance of Thakar(Raghunathji) are completed. One person goes from the temple of Raghunathji with a chhari (a long staff) to the palace to invite the Raja. On the arrival of the Raja the statues of Rama (Ragthunathji) and Sita are decorated with flowers and beautiful clothes and are placed in a palanquin. From the temple the Raja is offered a bagaa (about a meter long coloured costly cloth with which the devatas are decorated) and phargal to the other members of the royal family, and phagu to the sevaks. The procession then starts from the temple. The decorated horse of Narsingh remains in the front, at the foremost, after this come the raths (palanquines) of the devatas, band of the musicians and those who are traditionally required to accompany. Bijli Mahadev and Hidimiba attend it with their complete nishan (the retinue). After them come the members of the royal family, the band of priests, palanquin of Raghunath ji, the Raja and thereafter come the others. The wooden rath (chariot) of Raghunathji which is placed permanently at the northern end of Dhalpur ground is decorated with coloured clothes, ornaments and bells. According to the tradition some deities stay on the left, some on the right and others on the backside of the rath along with their bands of musicians, priests and kardars (manager of a devata). On the arrival of the statues of Rama and Sita they are placed in the rath. 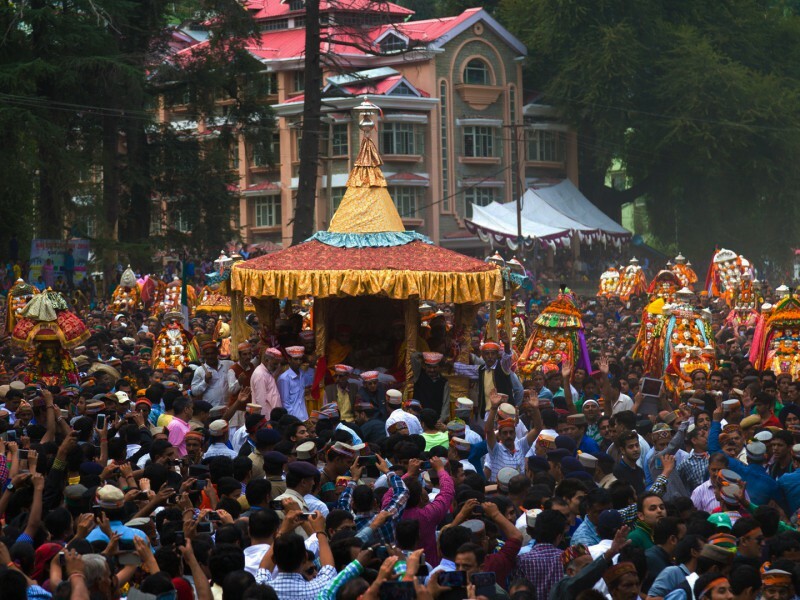 After performing prayer the Raja, members of his family, the priest of Raghunath and his sevaks, with the band of musicians take round of the rath five or seven times. On the last round the Raja touches the rope attached with the rath. Immediately the people shouting the slogans like Jai Siya Ram, Jai Hanuman, pull the rath and take upto the lower ground where it is stationed during the Dussehra period in the centre of the ground.